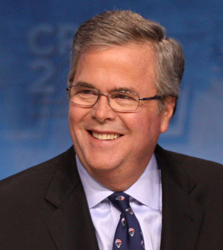 Jeb Bush has a plan to revamp the federal government, cut taxes, protect the country and revamp the nation's veterans health-care system. Now he's going after federal rule-making. The wonky former Florida governor has been making speeches or publishing policy papers on a variety of subjects roughly every 10 days since August. In each case, the plan includes some of his own ideas — many of them implemented during his governorship — combined with ideas drawn from legislation introduced by Republican lawmakers in recent years. On Tuesday, Bush did it again, this time unveiling a new regulatory reform plan during a meeting with farmers in Gladbrook, Iowa. His plan seizes on a basic Republican rallying cry: that the Obama administration has stifled job growth and further expanded the size, scope and power of government through federal regulations.